Please note: The download code will be sent to you in an email. 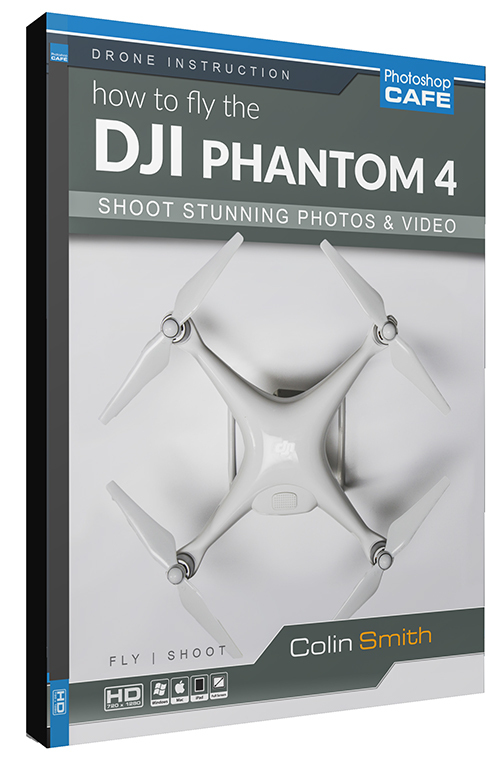 Learn to fly the DJI Phantom 4. Learn to stay out of the trees and make spectacular aerial video. Discover the best practices for safe, easy flying. It’s fun, but with the new FAA ruling, it can be profitable as well. It is scheduled to go in effect August 29th 2016. Then you will be able to take a multiple choice test and get a license to fly commercially. It is still evolving, but this is good news for video producers who want to add aerial video to their list of services! This video shows how to set up the Phantom 4 correctly and customize the settings to suit yourself. The app supplied by DJI can be very helpful, but until you see how it works in this video, it can be a bit overwhelming. Colin Smith is a good instructor and makes learning this quadcopter fun and easy. Flying this machine can be fun, but it carries some responsibility. This video will help keep you out of trouble. The flying exercises bring your skills up to par. See how Colin makes real photo and video shoots. Just by looking over his shoulder, you’ll get the hang of it quickly. You’ll also learn how to use the automated flight modes, so your drone can follow people or vehicles flying by itself. You will master how to make professional camera moves. Colin is always giving you his tips and sound advice that were earned from countless hours of actual flying. He is a passionate pilot, not a salesman.